built Crea's training plan.....she stuck to it perfectly. It was not designed for a BQ. It was designed to keep Crea healthy and get her across the finish line. Crea had trained on her own and, consistent with what I preach, she wanted to run the first 15-20 miles on her own so I was going to run about that far.....stop.....and wait for my wife. The plan was set, the day arrived but quickly things unraveled. My 2 year old was very sick......so sick we decided that I would not start this race but instead take Thalia to the ER. The 3 of us hopped in the car and headed to the finish line of the race where I would drop Crea off to be bussed to the start of this point to point race. After this drop off, I was fairly sure I would not only miss the start of the race but also the finish. The fact that Thalia was so ill, combined with a mess of closed roads and the fact that I had spent the entire week barely able to walk did not bode well for me physically being any part of this race. To say I was sad would be a tremendous understatement but our baby needed one of us and Crea needed to do this race. After dropping off Crea, the rest of the day was a lesson for me......of things I need to learn, reminders of things I had learned and since forgotten and an exclamation point on why I do what I do. The topics are simple but the day was profound. For the lessons to make sense I will give some quick bullets as to how the day went from the time I dropped of Crea. I took Thalia to Cottage Hospital. We walked right in and were in a room within minutes. Thalia was not feeling well at all and she clung to me like I was her favorite security blanket. While the circumstances were not pretty......as a Dad, I have learned to savor every moment that my kids want nothing more than to be with me. While sitting at the hospital, Crea and I kept talking before she dropped of her gear, and thus her phone. For whatever reason, the start time got pushed back two times. Instead of starting at 6:30 am, the gun did not fire until 7:00 am. This 30 minutes would come to be a blessing. I had sent a text to Crea's Dad that I was not in the race but was instead at the hospital with Thalia. It was very early in the morning but he showed up at Cottage to see that Thalia was okay. After a few hours and some x-rays of Thalia's lungs, we were given the okay to leave. Thalia's colorful personality was starting to shine through and I could tell she was feeling a little better. Two days from now it would all get worse and Thalia would be diagnosed with pneumonia but for now, things were okay. We went down the street to Crea's Dad's house. Thalia was happy to see her grandparents and was doing well. I could tell she was very tired from being up all night so I laid her down and rubbed her head until she fell asleep. This did not take long and I was encouraged that she was breathing okay so I went to hang out with Chuck, Crea's Dad. Chuck and I hung out for a while and had some good conversation. At around 9am, I began thinking I might have a shot at getting to the finish line. A quick reminder here.....I could barely walk all week from an ankle injury I have been unable to figure out. At 9:30am, Thalia is still asleep, Chuck and Wendy offer to keep watching her, so I get dressed to give my ankle an attempt at a run. That attempt was short lived. A few steps in and I knew any run would hurt. A few steps in and I knew this test didn't matter..... I was going to run to the finish line anyway...about 4.5 miles away. I begin my run and I am noticeably limping. I push through the pain as best as possible. As I often do while running, I talk to Isabella and my Dad (in case you dont know my story, both passed away. Isabella is my daughter) and ask them to go find Crea on the course and keep her safe and strong. In addition to getting to Crea, for whatever reason, I ask Isabella for a favor...to put in a good word and find some way to heal my ankle enough to allow me to keep running......just get me to Crea. Shortly after this talk with my angel companions, I am running completely pain free. Not limited pain......pain free!! I would not experience any ankle pain the rest of this day. I am keeping a 7:30-7:45 pace and I get to the finish line in no time. I decide to start running the course backwards hoping to get to mile 20 before Crea. Backwards entailed a lot of uphill but I kept my pace. I was so happy to be running knowing I was headed to see my wife.....something a few hours prior I didn't think would be possible. I got to mile 20. I started walking toward 19 but only made it a few minutes because there was Crea waving her arms so that I would see her. I had made it.......right were I had hoped to find her. I was 10.5 miles in. 6.2 to go and my wife would cross the finish line. We worked our way to the finish line. At mile 23, Tiana, my oldest daughter, was waiting for us. She s tayed with us for almost a mile and then we were off on our own. Crea was hurting but kept pushing forward. She does not have the best knees for running but she is very very strong willed and capable of pushing through pain. It was not until mile 25.5 or so that I knew exactly how much Crea was hurting. We were on a steep downhill.....death for bad knees. Crea started to cry and hyperventilate. For this to happen meant big pain. I knew a lot of the tears were tied to the pain but I also felt part of it had to do with the journey that makes the marathon so meaningful. From week 1 of a training program at Team in Training, I begin to preach about the journey. It is this journey that makes race day so meaningful.....all the memories of the path that lead you to the start line. For my wife, this path was the loss of our daughter and two battles with cancer. Just before mile 26 and we make it to Coby, Crea's brother. It was very cool for him to come down and cheer in his sister. I had been texting him at each mile marker so he would know we were making progress. I know his big smile of pride helped bring Crea home. Mile 26 and we are on the track at Santa Barbara City College. The school where Crea had started her post high school education would end this day. An amazing day. To this very minute, I do not know Crea's time. To this very minute, I do not care. I am certainly capable of being spontaneous..........like in college when I would spontaneously end up at a club instead of studying for a midterm.......but for big events, I can get thrown off when things dont go according to plan. Today would teach me differently. The day certainly did not start as planned but ended up being more than I could have ever scripted. November 6th could have solely consisted of the marathon which would have been amazing. Instead it included some quality time with both of my girls, Crea and Thalia. I was able to be a good Dad and take care of my baby while still being able to be with my wife for the last 6.2 miles of her marathon. I was able to hang out with Crea's Dad........someone who actually means a lot to me....and her entire family. If you go back and read the post for Isabella's Day and read the speech I gave at her Memorial Service, I talk of family and realizing through hardship that Crea's family was my own. For whatever reason over the years to follow I let that realization go blurry but today helped bring it back into focus. After my Dad passed away, Chuck stepped in and was like a father to me. I vow to never lose sight of this again and am grateful for the reminder. I mentioned at mile 23 getting to spend some time with Tiana. She is my oldest daughter (19)....technically my step daughter....but we have been together since she was 5. I try to live life without regrets but if I were to allow myself one, it would be to go back to when she was 5 and be a better Dad. I went from a bachelor living alone in a 3 bedroom condo to having a child and I had no idea what I was doing. Over the years, we have not been as close as I would like due to many circumstances but I do Love her very much. To share a mile with her today meant more to me than she probably knows. I guess if you really get in and dissect this day, it is support for my biggest belief......that blessings come from every situation. There was a very long build up to this day. It did not start out so well but so many amazing things resulted from the turn of events. Cancer knocked on my Dad's door. Cancer won that battle. While winning the battle, it dragged me into the war. That was a big mistake on the part of cancer.....one I am sure it regrets. Along the way, Cancer has won many other battles and, in doing so, has brought a lot of people like me into the battle to end the horrible disease. Cancer knocked on my wife's door twice. Twice! Two cage matches between my wife and the disease who should not be named (yes I am a Harry Potter fan). Crea's current record is 2-0. During the tenure of her battles, I have raised $80,000 in the fight against cancer. I have been on teams with Team in Training.......as a participant, mentor or coach that have collectively raised millions. Other organizations like the American Cancer Society's DetermiNation are seeing similar results.......people raising a lot of money in an all out war and race to find a cure. 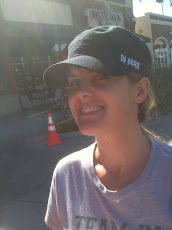 Watching my wife out on the streets of Santa Barbara wearing a huge smile reminded me that cancer is losing it's grip. It is losing the battle. We are closer to a cure today than we were 10 years ago. Gleevac was the last miracle drug.........what will the next one be. It is out there. Do you hear it coming cancer? Be scared. You will go down and I will be there to join in the celebration when you have gasped your last breath. Thanks for reading. I am incapable of being short winded. If you would like to join me in the battle against cancer by making a donation, there is a link to my fundraising site at the top of this page. If you would prefer to help in other ways, you can sign up for Team in Training. If you live in So Cal you can come spend 18 weeks being coached by me for the Summer 2011 season. I have also mentioned ACS DetermiNation.....another great organization. If you want more information on them you can reach out to David Pittman (@DP_Turtle) on Twitter. Thanks again for your time! !